The EcoList: Will Home-Brewed Hydrogen Save the World? Will Home-Brewed Hydrogen Save the World? The makers of a hydrogen refuelling station, ready for home-installation, claim it could move the world from the fossil-fuel age to a green and clean hydrogen age. All you need is a hydrogen-powered car … and they’ve been slow to come on the market because they need hydrogen fuelling stations. Sheffield-based ITM Power, claim their home refuelling station will make the difference, promising to ‘revolutionise commuting while cutting fuel costs and CO2 emissions.’ And they showed they meant business by running a converted Ford Focus on some hydrogen they made in the kitchen last night. The home refuelling station works via an electrolyser which (it says ‘ere) produces the gas from water and electricity. An internal combustion generator converts the gas back into electricity to provide power for the home. 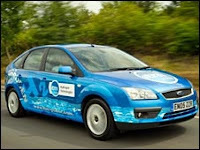 While the unit can only make enough gas overnight to provide fuel for 25 miles, the company believe that higher-pressure refuelling units in public places would be capable of offering enough hydrogen for cars to travel 100 miles. Is it the future, arriving just in time ? Or is it a scene from the next episode of Dr Who ? Watch the video and read the whole story here.